The holiday season is upon us. That means turkeys, trees, and fancy-pants parties! It also means you don't want to worry about driving around town to hit every shindig on your list. So what to do? Well, if you are as dedicated and fun as my co-worker Timo and his special lady friend, Esther, you could dress in your finest holiday wear, hop on your tandem bicycle, and pedal to all your events. You've never seen two people arrive at a party in finer fashion. But most of us are not quite at the Timo/Esther level of bike-fashioned style. Transit is always an option. The MAX is packed with Portlanders dressed to the nines on New Year's Eve. Of course, a tuxedoed-and-evening-gowned trip on the bus may not quite work for you (although it's sure to provide you plenty of fodder for cocktail hour chatter). Luckily, Portland has a host of taxi cab and limousine companies that are permitted by the City. That ensures that their vehicles are inspected and that their drivers are licensed and carry insurance. That's important for ensuring you a safe trip to your holiday event. Most of these cab companies are also willing to pop your bike in the trunk, which is always good to have in your back pocket in a pinch. 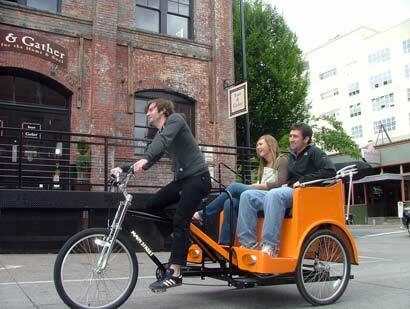 Portland also has a handful of pedicab companies. I don't really know much about the world of pedicabs, so if anyone wants to enlighten me in the comments I'd be happy to learn more.